Last night I was working on sympathy cards. I like what I came up with but it seems to winter-like using dark colors. (Cranberry and Choc. Chip). I needed to make a birthday card for my brother-in-law and I didn't have any ideas. I chose Wanted again. I really want the Bronco set but I'm not ordering it until October. I needed some inspiration and used a sketch challenge. I think I'm going to have to alter it a bit before I can send it off. It needs more. 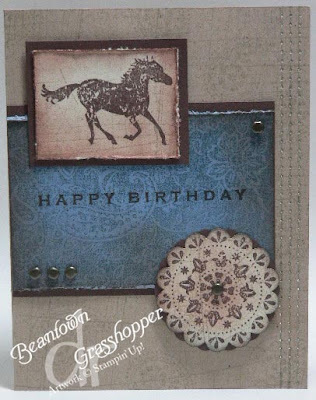 It is nice to be stamping again. Toys and more toys . . .
We have several birthdays coming up in the next 6 weeks. All three are looking forward to their birthday and starting to think about what they might like for gifts. 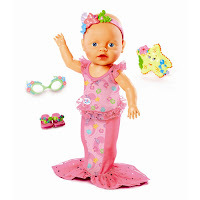 There have been commercials recently advertising a baby that swims. Both of the girls would like this. "You don't take baths anymore." "There won't be much room." This baby is made by Zapf. Back in the early days when I had no experience with potty training, it was recommended to buy a baby that had a toilet and would 'pee' to show your child how to do it. I did this. Let me tell you it didn't work. What works well for a boy is tossing some goldfish crackers in the toilet and having a little target practice. Keep an eye on him that he doesn't toss the goldfish crackers on the living room floor and take aim though. I haven't been to the dentist since we moved here. I never had a problem going to the dentist until that last time. It put some fear in me. I'm finally biting the bullet and going to get my teeth cleaned today and I will need some additional work done. I left the last dentist with more work to be done, I just couldn't overcome the fear. I guess I fear having no teeth when I'm older more so today is the day. Everything is getting back to a schedule and we are adjusting to the home schedule and the demands of various teachers. I'm surprised by the the amount of homework that has been given already. With all of this, we need to revise how and when we do things. Read below for the ordeal, but here is the recipe. Grease 9" cake pan. Bring all glaze ingredients to simmer over medium heat. Cook until mixture thickens and clings to back of spoon, about 5 min. Pour into prepared pan. Cool until glaze hardens, at least 20 minutes. Adjust oven rack to lower-middle position and preheat oven to 350. Combine all filling ingredients except butter. Using fork, stir in butter until mixture resembles wet sand. Orange Sticky Rolls . . . FIRE!! I had some buttermilk left over from another recipe and I didn't want to waste it so I pulled out a recipe I've been wanting to try. First off, let me say that they taste really good. I was pleased that it wasn't a yeast roll needing time to rise. I received a SMAK (small act of kindness) a week ago with this fold. I thought it was too cute when I opened it and wanted to make one myself. I thought of a snowman straight off for some reason. Perhaps it is too hot here. 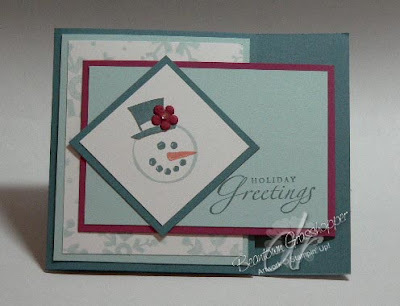 WW is 3-3/4 x 3 and a 2" square for snowman. The bayou has the fold on the left and the pomegranate has the fold on the right, adhered onto the bayou. Super easy card and fun to do. Plus there isn't a lot of space for writing when you use the pomegranate for the greeting and that is great when you are a person of few words. What is better than peanut butter and chocolate? I made these brownies today and they are delicious! I think there are three left. They were enjoyed by friends and my kids. I went with a couple of friends to see this movie last night. I didn't know anything about the movie, just that others had said it was good. I enjoyed the movie. It was really odd to see John Travolta dressed as a woman. A fun part for me was the singing in the audience of the theatre. There was a point in the movie with all of the dancing that you just wanted to get up and dance yourself. Still don't know if I would buy the movie, but it was a lot of fun to watch.